Is Arrogance a Factor in Success? I saw a recent Twitter thread discussing the arrogance of Steve Jobs. One person (ok, it was my buddy Rob) postulated that it was this very arrogance that led Apple to their successes. I suppose it’s quite possible that it had a factor, but I tend to think Steve Job’s vision and drive were much bigger factors. This idea is a reflection of a pervasive belief out there that arrogance is excusable, perhaps even acceptable and admirable in successful people and institutions. In contrast, I think we’d all agree that that arrogance is universally detestable in unsuccessful people. But is arrogance necessary for success? I certainly don’t think so. I think there’s an alternative characteristic that can lead to just as much success. Instead, the word often associated with them is “Joy.” When Brazil plays, their joy for the beautiful game is so infectious you can’t help but share in the joy when they win. Heck, even as you’re grumbling about your own team losing to them, it’s hard not to join in the Samba spirit (again, unless you’re from Argentina). This is a team that has been incredibly successful over the years and arrogance was unnecessary. I think there are probably many examples in the technology and business world we could point to where incredible success and visionary leadership came from a joy in the work they do rather than arrogance. Have any examples for me? Leave them in the comments. Phil, I'm from Brazil and I have to agree with you about two things. First, Brazil's national team from 1970 was one of the best teams ever. Second, there's much more than arrogance in Steve Jobs. If you look at him back in 1996, where he stood on stage at Macworld 97 (http://www.youtube.com/watch?v=PEHNrqPkefI), he talks about creating a good strategy so that people at Apple could believe it and follow it. And I personally believe that, during that fisrt four years of hard work (1997 - 2001) where Apple was recovering itself, a lot of joy, passion, and even a sense of "major calling for a greater good" existed back there. But there were also doubts, pain, pride and other feelings that appears during long periods of hard work and no result (let's face it: four years of extra-time, few hours of sleep and pressure is a long time) can damage or even destroy your strategy. So there's a need for a leader with absolute certainty about the future. People need a leader with a vision that doesn't change, specially in hard times. Sometimes it can be confused with arrogance, but it ain't. Oh, one more thing. Once you brought sports as an example of success, let's use another one to show how exagerated belief in winning was confused with arrogance. Let's use Muhammad Ali (http://www.youtube.com/watch?v=7I1bLBGxbI0). Well in fairness you only showed part 1 of a 2 part tweet :). My main point was that people use the term "arrogant" when they don't like someone who has drive and vision - enough so to stand by it in the face of opposition. Critics use the term when they don't like what you're doing - critics of Gates/Jobs use it in the same vein. Phil, I think that yes, arrogance is required for the biggest success, and you can see it in both Steve Jobs and in Pelé. When the success comes though, the arrogance is often called self belief or confidence. 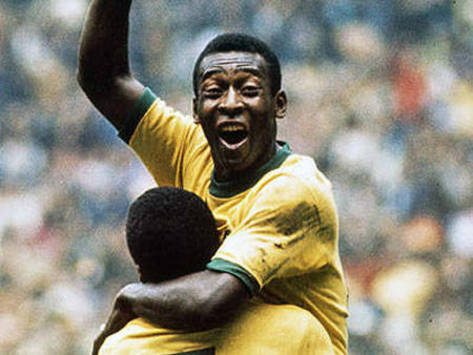 Look at some of Pelé's greatest moments; to even attempt moves with such audacity requires so much faith in oneself that what else is it but arrogance? Self-confidence and tenacity are certainly a factor, with arrogance an occasional by-product. Phil, I think you're right that vision and drive are the key factors. But to me they are base classes from which arrogance is just one of many derived classes that people have to choose from. I'd actually argue the exact opposite. Folks like Jobs and Larry Ellison are the exception that confirm the rule. The rule being that the valley of failure is full of arrogant and incompetent people. Arrogance will often get in your way to success. One has to be much deeper than the simple projected image of an arrogant leader to achieve notable things. I think the hardest thing is to administer your own success and the perception toward your public persona. I don't believe that a significant portion of our Industry's (or any industry even) exponents are really arrogant in nature. They just don't pay attention or don't have the skills to keep a positive demeanor. The problem may be more in what we as a society reward with success. Every single one of the most brilliant and talented people I've met in my life were extremely humble and all the arrogant ones were hiding something. It was in lines of work that don't receive much attention from the media though. Maybe arrogance is a factor for success in lines of work that get the media's attention. Arrogance is not a prerequisite for success. However, you need to have a decent amount of self-confidence and not be afraid to say what you think or know. That is sometimes mistaken for arrogance. It's clearly a very fine line. Oh, I hope the Dutch team win the World Cup. Hup Holland hup!!! Are you in south Africa for the world cup? Its the middle of winter, but the vibe is really heating up. Is success about how much money you have? respect? selling a piece of hardware? how many true friends/human relationships one has? Quite the opposite, I believe in order to be "truly" successful one must try NOT to be arrogant. @Owen I feel lime you and others are redefining the term "arrogant". Self confidence and pride do not equal arrogant. Arrogance is marked by a sense of one's superiority and the inferiority of others. That's just not an attitude I see in the likes of Pele. A person's arrogance is reflected in how they view and treat others. Self confidence is about how one sees oneself. See the difference? @Rob I see your point. Sounds like your saying people tend to level the "arrogant" accusation innaccurately when they are just jealous. However, my point is that it's not *always* the case. I think when people read your tweets, they thought you were saying that *all* accusations of arrogance were simply due to pettiness and envy of self confidence. As I mentioned in my last comment, there's a difference between confidence and arrogance and you can tell them apart. Given that definition, would you claim Jobs is not arrogant? I've never thought of him as arrogant, but I don't know how he treats others. Speaking of arrogance, success and football/soccer you just have to mention Jose Mourinho. That is a leader that taken arrogance and almost made it into an art form, and he is arguably the most successful manager in the game currently. And since we are within context... Go Mexico!!! John Wooden and Mr. Roger were two very confident and successful men you'd be hard pressed to find critics who would label them as arrogant. Dude, it's Football, not soccer. While I am not a big fan of Arrogance it can be a factor in success. In any creative field you must have a way to deal with negative consumer feedback. It is one way to do it. Arrogance can allow someone to create things in a vacuum of feedback. Which means if you aren't brilliant or don't just "get" what people want/need then you are going to fail every time. Even when you are brilliant and get it, you still fail many times. Steve Jobs has had many failures. I would argue joy is something different completely. Joy is about creating excitement within yourself, your company, and your consumers. Joy is about motivation within all important groups (you, your org, and your consumers). Arrogance is about removing a demotivator within you and only you. The demotivation is loss of will do to negative feedback. In conclusion, I don't think that joy and arrogance have to be mutually exclusive. Look at the joy people have at going to the WWDC, or the joy that Steve Jobs and his people take with creating and presenting new products. And yet Steve Jobs is still very arrogant. First you would have to define "success" and even "arrogance." Where on the continuum from quiet self-confidence to outright arrogance do you draw the line? "Success" is an even more nebulous term. If you mean somebody with a lot of money (what is "a lot"? ), then a lottery winner is successful, as are many criminals. If success is winning a major sports event, then the "victors" (Cincinnati Redlegs?) over the Chicage "Black" Sox in 1919 (?) were successful. For the generally accepted definition of success, and the generally accepted defintion of arrogance, you could find many "successes" who were arrogant and otherwise, and for arrogant people you could find many who were successful and otherwise. Personally, I don't think it's a factor; it's a characteristic that some have, whether successful or not. It's certainly not a necessary trait. I think one's perception of one's worth affects greatly their achievements. It makes sense that a person can do great only if they can get over their previous failures; and as success seems to be a long series of failures followed by some smashing hit, I believe arrogance certainly helps to get over the bad times. Of course, if arrogance is all that person has, it stands to reason that they will never get to to good parts either. I'll go ever further: the secret for personal happiness is an axiomatic view of one's self worth. If I think I am great, even if I may not be (I know, propostrous :D), I at least dedicate the part of the brain responsible with second guessing to other uses. People would like to equate Steve with Apple and what Apple does but it's probably perception more than it is the whole truth. People are eager to put figureheads on corporations and then think that Apple's strategy and vision somehow flowed through a single divine entity and genius, even to the point that we start to attribute our perceptions of their personality on the company. What a ridiculous idea. I am sorry but Steve did not come up with iPod nor did his perceived arrogance influence the design or the business model. I believe that arrogance is not necessary, but the lust for money is. This is what drives Steve Jobs and Google, too. Without a stated definition of what "arrogance" means, then you may as well delete this post. We need to be a bit more scientific about our discussions, even the casual ones. With a stated definition, you may as well just look into studies on the topic. Asking about an "opinion" is pointless as facts are facts and "believes" change nothing. Furthermore, given a definition of success being "to achieve a stated goal", if your goal is to go into a room with 100 aliens and kill 2 of them, then you enter that room and kill 3 aliens then get eaten by a group of the other aliens, that 3% kill is NOT "3% success" or "epic fail". It's 100% success (by the above definition) with some over-achievement. This person should be given the award for success and another for over-achievement. The moron who sets a goal to kill 50 of them and only kills 3, will not receive any awards as he is a moron. If you are calling self confidence "arrogance", then this entire discussion is pointless. We all need self confidence. If, by arrogance, you mean what we normally call (in colloquial terms) "cocky", then no, you cannot have that in success at all. You add that, you die. The man who stated that he could kill 50 aliens and only killed 3 is a loser (by definition; given that loser is the polar opposite of success) and should not be honored at all. Do not confuse bravery with stupidity or confidence with arrogance. We call someone "arrogant" when they think they are right and we think they are wrong. I don't think we can call Jobs(or Gates) as arrogant. They knew what was right and proved the critiques wrong time and again. Just because someone doesn't agreed to preset rules, doesn't make them arrogant. I think arrogance is a hindrance to success. It usually gets in the way of accepting constructive criticism, something that is absolutely critical when you building something new* (i.e. flash on the iPad). I think the premise at hand is the very fine line between arrogance and confidence. Confidence is as key in leadership as it is in PR, but the fine line is difficult to analyze at the time of action; the classification tends to be more reliable retrospectively. Arrogance is not rooted in fact, but in opinion; confidence tends to be based on concrete data. If there's a strategy or a design that's been mapped out, confidence may be necessary and at minimum tends to be very helpful in accomplishing that vision. Just the same, if the plan is lacking or looks good at the 10,000 foot view but doesn't translate well to implementation the "I'm sure it will work" attitude may be unfounded and arrogant. Ultimately it's difficult to ascertain at the moment of declaration without having been a part of the process as many of the finer details aren't meant for the public eye. In cases like this analysis of Steve Jobs it can be even more complicated by the possibility that his public statements may (an, in this case, likely are) part of that strategy. How do you market a product if your public announcements are things like "We're pretty sure it'll come out real nice" instead of "This is going to be the greatest thing since sliced bread"
I´m a brazilian software developer, and I must say that it was the most incredible post that I read, about the results of somehting that we do for passion, enjoyining it. I feel like that, and it´s great when you work on something and enjoy it. I think the driving force of popularity - it is a clear concept. The joy or pride or other feelings - it all depends on the leader and his personal qualities. A great leader can bring great results, but the essence of a contagious behaviour must have deep roots, if someone don´t like what he does or what he has to spread, it will be just a fake, something sustained by comercial strategies and sponsors interests but far from the pleasure that you can feel doing something that you have a passion, and use it because is natural not enforced. Even though this post is quite old, I was compelled to say, couldn't agree anymore.